This Sunday we will have another potluck as we decorate the church for Advent and Christmas. This has become a yearly event enjoyed by all – especially the children and childlike among us! It is also my 50th birthday so come and celebrate! Advent is a time of hope, a time of looking forward, a time to embrace the promise that, in the end, all will be well. We need hope after the recent election shocks that many of us have experienced! That hope is found in Jesus who still promises a better world where swords are beaten into ploughshares and spears into pruning hooks! At All Saints we seek to bring hope and reach out to the marginalised and those in need in our community, to stand with sexual and racial minorities who suffer discrimination and abuse. 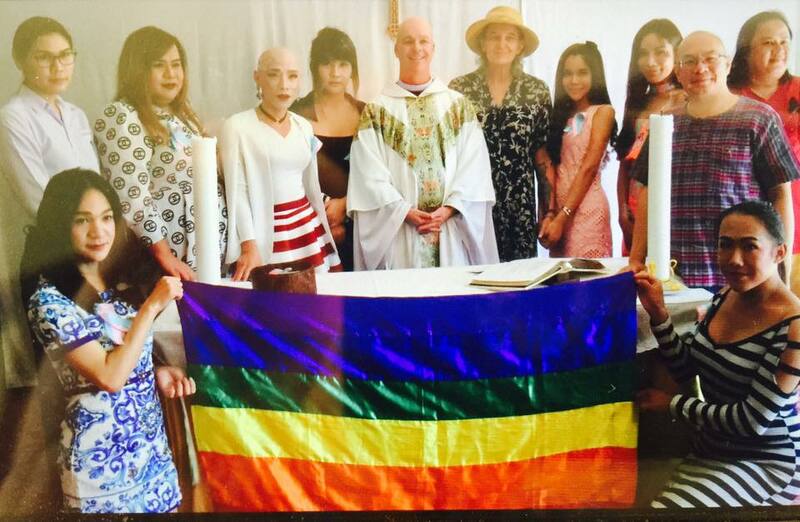 As part of this calling, more than forty people attended our worship last Sunday as we marked The Transgender Day of Remembrance. This our mission: to be here, and to bring God, to all. Meanwhile, this Friday night we will have the second session of Theology on Tap. We will again meet at the Gekko Garden at 7 p.m., and this month our topic is Heaven and Hell! All are welcome to join us for our Advent and Christmas events, but you will need a ticket for the Festivals of Nine Lessons and Carols, and to sign-up if you want to share Christmas lunch in the church. Our readings for Advent Sunday will be Isaiah 2:1-5, Romans 13:11-14, and Matthew 24:36-44, and we will be singing the hymns O Come O Come Emmanuel, Born in the Night, Come Ye Thankful People Come, and Come Thou Long Expected Jesus! Our sermon will be entitled The Audacity of Hope! November is a month of remembrance in the Christian calendar. It begins with All Saints’ and All Souls’ Days, and they are followed by Remembrance Sunday, when we remember the dead from two world wars, and others who have lost their lives in conflict in the last hundred years. This year the Transgender Day of Remembrance, 20th November, also falls on a Sunday so we have chosen to mark it in this week’s service. Of course, there are many groups whose lives we should remember, the Black Lives Matter movement clearly illustrates this, and we should also set aside time to remember those who have died as a result of domestic abuse, endemic diseases such as malaria, or in other terrible situations. But November 20th is the Transgender Day of Remembrance, so we will take this time to remember those who have been killed for no reason other than their courage to stand up and be the people that God made them to be. Connie Mudore will be preaching, and our hymns and prayers will reflect the message of the day. Our readings will be Jeremiah 23:1-6, Colossians 1:11-20, and Luke 1:68-79, and we will be singing All Hail the Power of Jesus’ Name, Stand up stand up for Jesus, One Bread One Body, and Hear I am Lord! The readings can be found via this link! 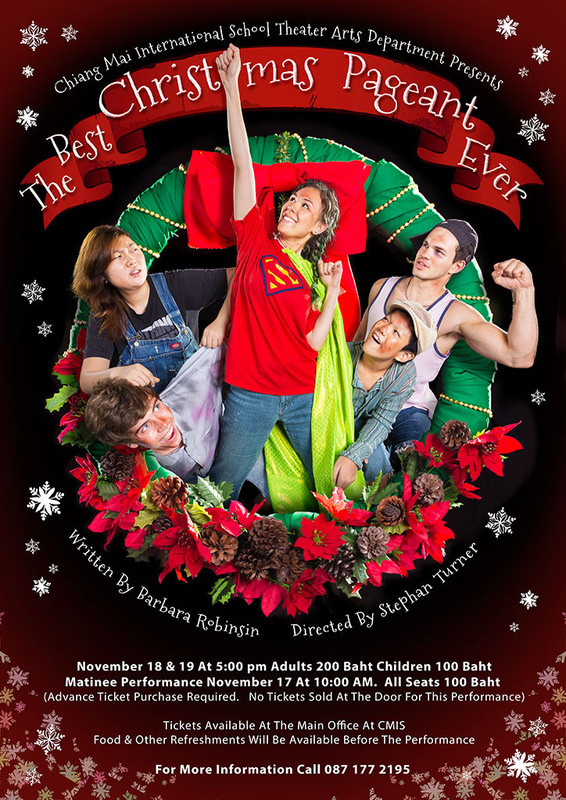 Meanwhile, this Friday and Saturday you can see our own Nate Tipton appearing in The Best Christmas Pageant Ever at Chiang Mai International School. The performances begin at 5 p.m. Tickets are THB 200. This year, American Thanksgiving falls on 24th November. To celebrate the day a group of us will be going to Bake and Bite. 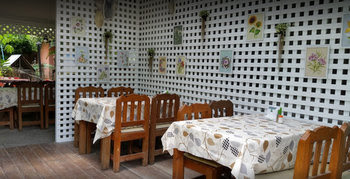 The cost is THB 700 per person, which is expensive, but it is a great buffet with all the traditional dishes. You can sign-up on Sunday. We will begin eating at 7 p.m. The next meeting of Theology on Tap will be on Friday, 25th November, at Gekko Garden, when we will discuss Heaven and Hell! The adventure begins at 7 p.m.
Next Sunday, November 27th, is Advent Sunday! We will have another potluck as we decorate the church for Advent and Christmas. This has become a yearly event enjoyed by all – especially the children and childlike among us! It is also my 50th birthday! This year the Prince Royal’s College chapel is not available due to extensive renovations, so instead we shall hold our Festival of Nine Lessons and Carols in our own church building. This will be on both Friday 9th AND Saturday 10th December beginning at 7 p.m. We will have two services to try to accommodate as many as we can! There will be a limited number of tickets on sale for each night. Christmas Day falls on a Sunday this year, so we will have our usual 11 a.m. service, and also a Midnight Mass beginning at 11:30 p.m. on Christmas Eve. This is an extra email to remind you of a few up-coming events. Tuesday 15th November 6:30 p.m.
We will be meeting at church at 6:30 p.m. to walk down to enjoy the Loi Kratong celebrations. You won’t get your car any nearer – see the map below showing possibly closed roads! The Best Christmas Pageant Ever! 5 p.m.
Our own Nate Tipton is among the cast in this fun play at Chiang Mai International School. Tickets cost THB200. Tickets can be bought on the door. Thursday 24th November 7:00 p.m.
A group of us will be going to Bake and Bite to share their excellent Thanksgiving Buffet. If you would like to come please let me know as soon as possible. The cost is THB700 per person. November 11th is Remembrance Day. 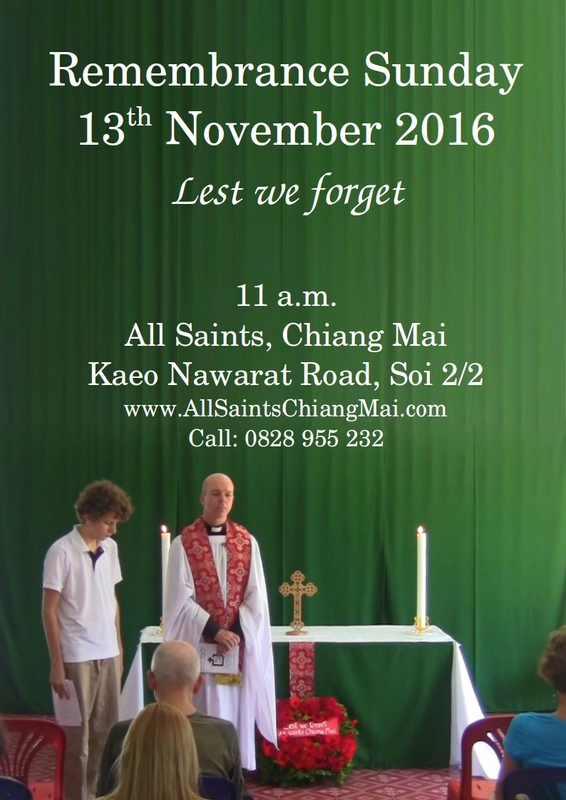 There will be a short ceremony at the Chiang Mai Foreign Cemetery beginning at 10:30 a.m. organised by the Royal British Legion. This will be followed by lunch at the Gymkhana Club. Everyone from All Saints is welcome to join. This will be followed by Remembrance Sunday. Sunday 13th November is Remembrance Sunday when we will remember those who gave their lives in the two World Wars and subsequent armed conflicts around the world. Our service will include the two minutes’ silence following the playing of the Last Post. 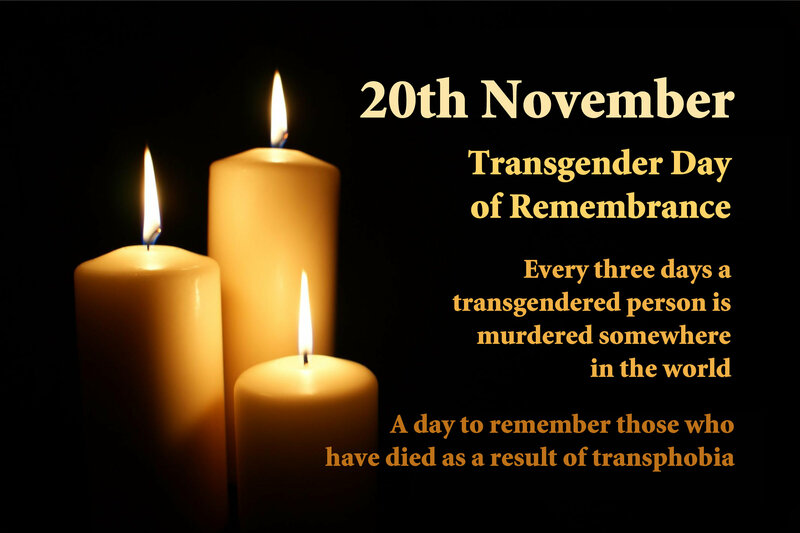 The following Sunday, 20th November, is the Transgender Day of Remembrance. We will have special prayers at All Saints to remember trans people who have been killed, and those who suffer for who they are. This year, American Thanksgiving falls on 24th November. To celebrate this day, and also Iain’s 50th birthday on 27th November, a group of us will be going to Bake and Bite. 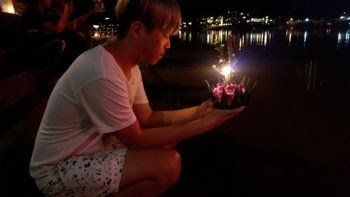 The cost is THB700 per person, which is expensive, but it is a great buffet with all the traditional dishes. You can sign-up on Sunday. On November 27th we will have another potluck as we decorate the church for Advent and Christmas. This has become a yearly event enjoyed by all – especially the children and childlike among us! It is also my 50th birthday! This year the Prince Royal’s College chapel is not available due to extensive renovations, so instead we shall hold our Festival of Nine Lessons and Carols in our own church building. This will be on both Friday 9th AND Saturday 10th December beginning at 7 p.m. We will have two services to try to accommodate as many as we can! There will be a limited number of tickets on sale for each night. If you would like to sing in the choir, contact Deb Childs on childs.deb@gmail.com. She is the director of Lannacapella who will form our choir for the Nine Lessons and Carols this year! Rehearsals are on Wednesdays at 2 p.m.
Our readings this Sunday will be Isaiah 2:3-4, Revelation 21:1-6a, and Mark 13:5-13, and we will be singing the hymns O God our help in Ages Past, Abide with Me, O God of Earth and Altar, and The Day Thou gavest Lord is Ended. 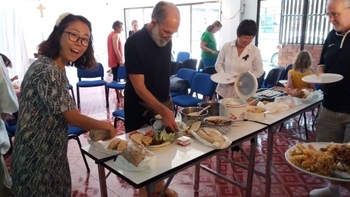 Last week we had a wonderful celebration of All Saints Day, and a great potluck! Over the next month we will be thinking about life beyond this life as we look at the hope of the resurrection this week, and remember those who have died in war the following Sunday. The Christian faith is one grounded in the hope of the resurrection – it is good news indeed! If you would like to sing in the choir, contact Deb Childs on childs.deb@gmail.com. 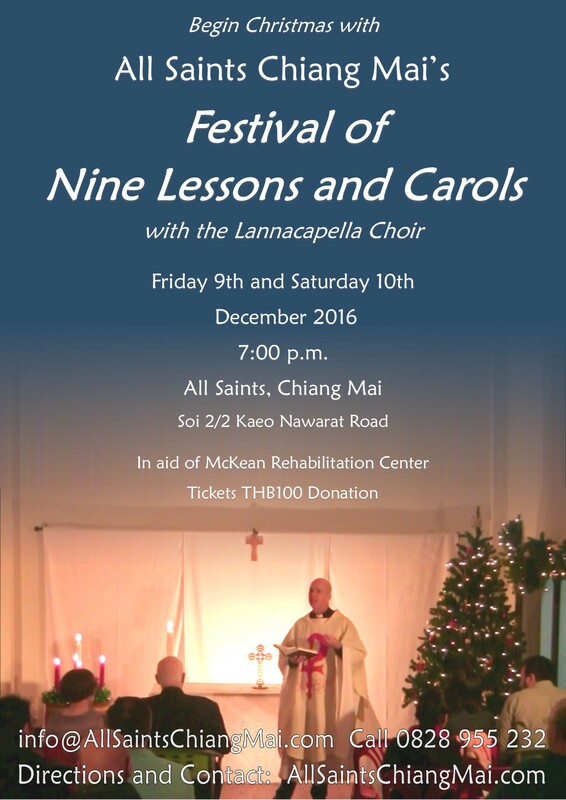 She is the director of Lannacapella who will form our choir for the Nine Lessons and Carols this year! Rehearsals are on Wednesdays at 2 p.m.
Our readings this Sunday will be Job 19:23-27, 2 Thessalonians 2:1-5, 13-17, and Luke 20:27-38, and we will be singing the hymns All Creatures of our God and King, There is a Day, The Day of Resurrection, and Sing We the King Who is Coming to Reign! The readings can be found via this link!